“Hi, my name is Maria”.... I cringe when I think of all the stories I started that way as an elementary school student. Yet almost EVERY tale I wrote during my childhood was science fiction. Aliens, time machines, and spaceships have formed the fabric of my world for as long as I can remember. Ask me to create my own currency in 3rd grade during a unit on banking? My coins were from Mars and had tentacled aliens on the face. Tell me to draw a symbol to represent myself in 4th grade? A little circle with a ring around it. Yes, I even claimed to be from Saturn when kids thought I was being strange. I grew up watching Star Trek (thanks, mom & dad!). Han Solo was my first serious crush. Leia was, and is, my rock star. My first memory of reading science fiction was Out of the Silent Planet by C.S. Lewis in fifth grade. I just couldn’t get enough of outer space! For most of my life, I labeled myself a “geek boy”. You see, all of my interests seemed to align most closely with the geeky guys I called my friends. I didn’t mind, really. The man who is my husband now was my pal in high school - and he won my heart when he handed me a duffel bag full of science fiction novels I could borrow. Over the past few years, my online life has connected me to more and more women who share my odd passions. Women like Consetta Parker and Tricia Barr who have always loved Star Wars. Women who adore Spock. Women who read science fiction. Women like Karen and Sherri who will be joining me in celebrating the 50th anniversary of Doctor Who. Women who attend conventions like Geek Girl Con (Haven’t gone yet, but hope to get there one day!). Women who have helped me realize that there is a whole world out there filled with ladies like me who love science fiction. My current life work is teaching gifted elementary students and raising two geeky sons. I love the fact that my sons share so many of my science fiction interests. My older son has read Ender’s Game several times to get ready for the movie. My younger son adores Doctor Who. 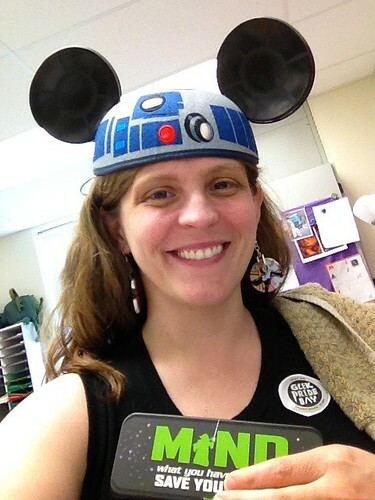 My favorite thing, though, is showing off my geeky pride to my students. I want to be sure that every child who passes through my doors knows that love for science fiction (and fantasy, and other geeky pursuits) is NOT a “boy” thing or a “girl” thing. It is a human thing. A Spotlight on science fiction for kids and teens, since that is my focus at work. I’ll share new titles, upcoming titles, and link to my many recent reviews and posts on the topic here on my blog. In the meantime, please check out the links to my Pinterest Board about science and science fiction. I share reviews and links to science in the news that would spark interest in - or create ideas for - science fiction. Doctor Who Week! A librarian friend and I will be co-sponsoring a great week of Doctor Who posts and giveaways starting November 17th. We’ll be talking about favorite episodes, sharing costuming and activity ideas, and even having a few guest posts by young adult authors. Be sure to come back and join in the fun! Reflections on Science Fiction - including thoughts about the idea of creating families in my favorite shows, the variety of types of women in science fiction (or sometimes lack thereof), thoughts on teleportation, and whatever else pops into my crazy little mind along the way.